In Stock, ONe ONLY! Last one! 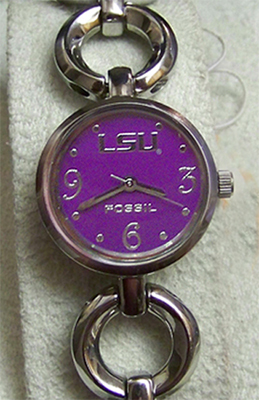 Click the button below to add the LSU Tigers Fossil Watch Womens Ladies Open Link Bracelet Wristwatch to your wish list. Ladies NCAA college sports fans team logo watches. One only: Last one! In hand So SHIPS NOW! LSU Tigers Fossil womens watch, new. 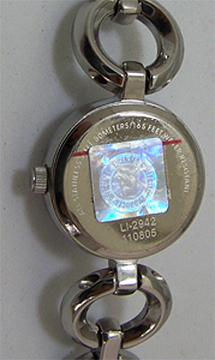 This ladies open link stainless bracelet wristwatch features the team logo at 12 O'clock against team colored watch face. Stainless steel case and bracelet, case diameter 22mm, bracelet diameter:16mm, water resistant to 5 ATM ( 50 meters, 165 feet). The band has 4 links that are removable by hand with no tools required allowing the watch to fit a wrist from 5 1/2 up to 7 3/4 inches. 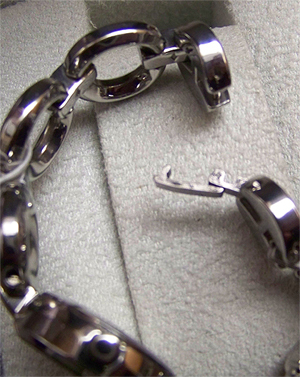 Additional links could be removed with a link tool to accommodate an even smaller wrist. This is a new, unworn working Fossil watch with brand new battery. Very rare to find one in new condition as they have not been made for several years. We have only one of these!